My original field of expertise is metamorphic petrology and I have developed a special interest on the evolution of crust in large hot orogens. The Mesoproterozoic (~1.0 Ga) Grenville Province in the Eastern Canadian Shield, commonly compared to the modern Himalaya-Tibet system, was developed on the long-lived Andean -style margin of Laurentia and is part of a global-scale network of hot to ultra-hot orogens of similar age. it provides a record of (a) crustal formation processes in active margins; (b) crustal evolution in a continental collision setting; and (c) orogenic processes in middle to lower crust, which is not accessible in modern analogues. - crustal evolution between 1.6 and 1.1 Ga in the central Grenville (e.g. Dunning & Indares 2010; Groulier et al. 2018b & in progress). - protolith identification and tectonic setting of ~1.2 Ga volcaniclastic sequences, metamorphosed under granulite facies conditions during the Grenvillian orogeny (e.g. Indares & Moukhsil 2013; Lasalle et al. 2013; Hindemith et al. 2017). -- Groulier et al. (2018a,b): in collaboration with MRN, Quebec. 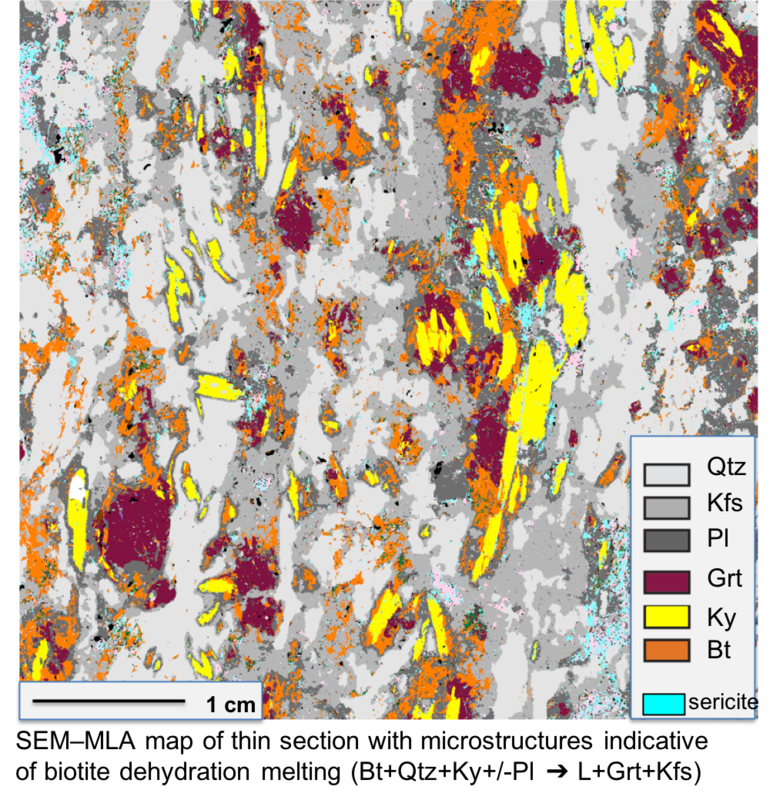 Widespread exposure of granulite-facies, deep to relatively shallow levels of the orogenic infrastructure in the central Grenville, makes it an ideal laboratory to investigate high-T metamorphic processes and anatexis at wide range of depths. - Metamorphic diversity across the hinterland: P–T paths, tectonic implications (e.g. Indares et al. 2008; Lasalle & Indares 2014; Patrick & Indares 2017); and 1st order time constrains (Dunning & Indares 2010; Lasalle et al. 2014), using aluminous granulites. For this research component, were used diverse and novel imaging of microstructures (e.g. Kendrick & Indares 2018a,b) integrated with thermodynamic modelling, and U-Pb geochronology. - Relations between metamorphism and synorogenic magmatism (Groulier et al. 2018a; & in progress).